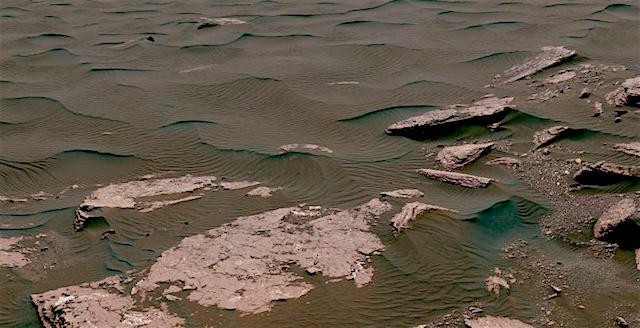 • Curiosity’s imaging campaigns in the Bagnold Dune Field reveal that impact ripples migrate up to ∼3 cm/sol during southern summer. • Impact ripples generally migrated towards the southwest within a 70 degree range about their mean migration direction. • Sand-flux estimates are consistent with low-flux saltation occurring below the fluid threshold of sand transport. A wealth of orbital images have revealed that wind is actively moving sand on the surface of Mars; landed instruments enable a closer look at these processes. Images acquired during southern summer by the Curiosity rover in Gale crater revealed high levels of wind activity, in contrast to previous imaging done during southern winter. A majority of ripple migration occurs towards the southwest, with ripples moving up to 2.8 cm per day. This entry was posted in Reports and tagged active dunes, Bagnold Dunes, Cape Elizabeth, Curiosity, Dorr Mountain, Gale Crater, Mapleton, Mars Science Laboratory, MSL, NASA, Ogunquit Beach, Precipice, sand, sand dunes, Sandy Point Beach, Southern Cove. Bookmark the permalink.